Biergarten zur Mühle is located near the Isar river in Ismaning, a small and over 1,200 years old town about 12km north of Munich city centre. 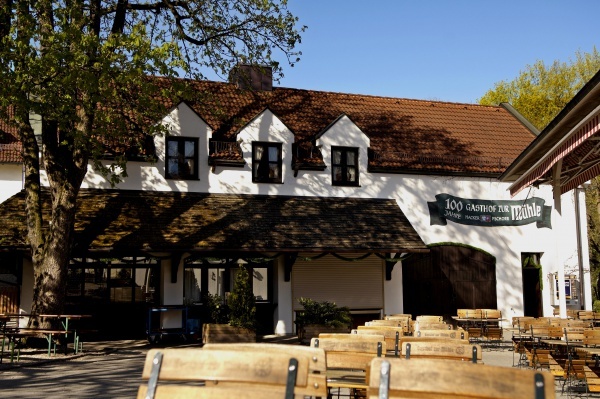 The name Biergarten zur Mühle refers to a former corn and sawmill that was once powered by the small Seebach stream that runs through the property. Zur Mühle is in the hands of the Sedl family since 1857. In 1894, a restaurant and beer garden was opened. In 1982 a hotel was built, the restaurant was renovated and the beer garden was extended. Today the Sedl family leads the business in its fourth generation. The current hotel building stands where the old mill was once located. The beer garden has 600 seats in the self-serviced area and 150 seats on a serviced terrace. The self-serviced area has standard beer garden benches, some of which have back support. 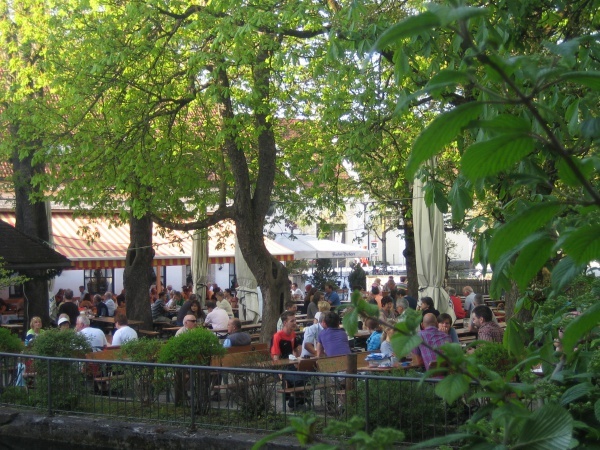 Large and over 100 years old chestnut trees shade the beer garden in combination with some large sun-umbrellas. Although the food stall is small, it offers traditional beer garden meals, such as Schweinshaxn (knuckle of pork), Hendl (roasted chicken) as well as Obatzda (Bavarian cheese specialty). The beer served straight from a wooden barrel is Hacker-Pschorr and a Helles (lager) is priced €6.30 p/Maß (April 2013). During the beer garden season (usually from April or May to end of September) the beer garden is open weather pending daily between 10.30am and 10.30pm.